After our visit to the Yayoi Kusama Museum Thursday morning, Katie and I set out to explore Shinjuku. 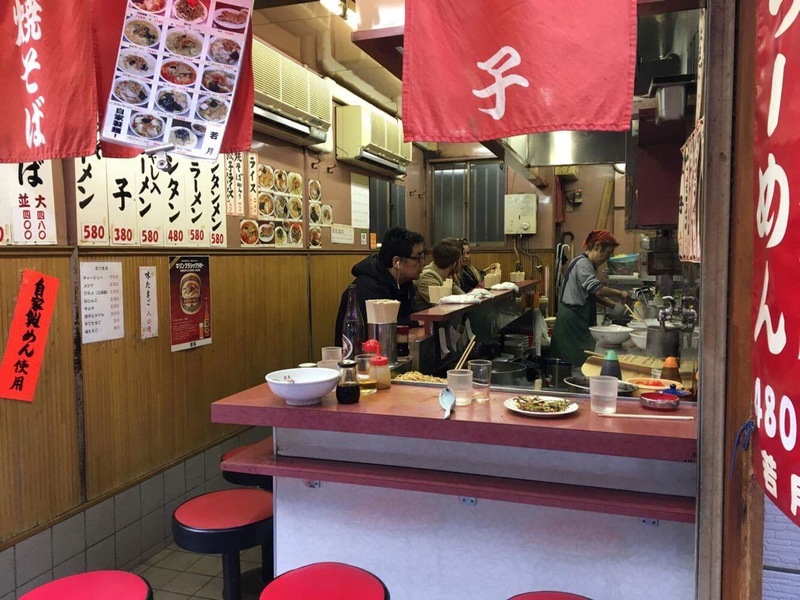 We visited Shinjuku back in February and still had more on our list of things to see. Our first stop was for lunch. We stopped at a conveyor belt sushi restaurant. It was delicious! After lunch, we visited the Tokyo Metropolitan Government Building. During normal business hours, visitors are able to go to the 45th floor for free. The view was spectacular. It’s hard to see, but in the far background of the photo below is the Tokyo Skytree. While at the top, we went into a Japanese photo booth. They are like Snapchat Polaroids. Visiting one has been on Katie’s list. 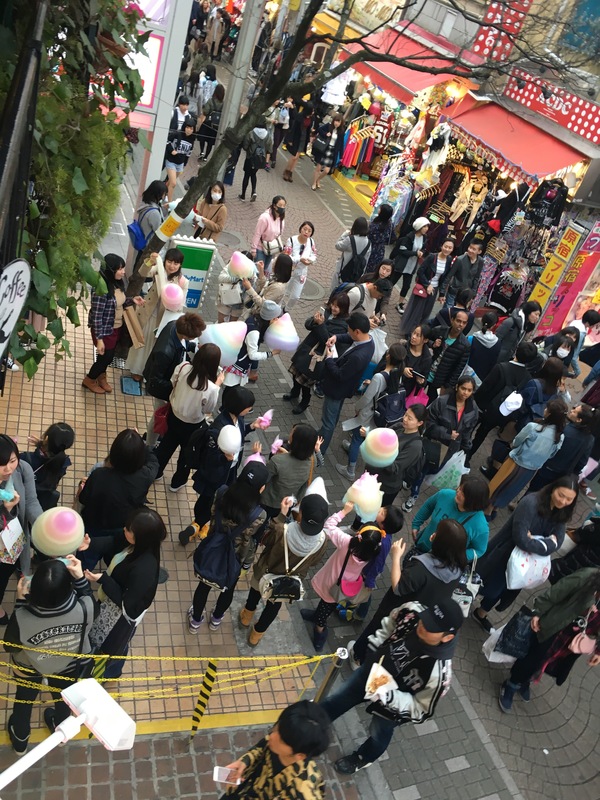 We will need to visit the ones in Harajuku. This one was kind of amateur hour. Regardless, our creations were hilarious. After our trip to the top, we went back to area where we ate lunch. Or as we started to call it “crazy town.” There was so much going on, everywhere! As we were walking around, we found this great craft beer and pizza restaurant called Tap Stand. We needed to visit! We both ordered the green tea IPA. Yummy! It was approaching dinner time and we were getting hungry. Who doesn’t love pizza!? !from the suggestion of our waiter, we ordered the thin crust mushroom pizza. It was delicious. This restaurant will be a place to return with Dave. On the wall above the kitchen were numerous American brewery stickers. I was so excited to see Lakefront, Lagunitas, and Revolution stickers. It was like Chicago was welcoming us back home! As I’m looking closer at the stickers in the pictures, I realize there is a Tap Stand Brewery sticker. Now I definitely need to go back! After dinner, it was time to head back home. 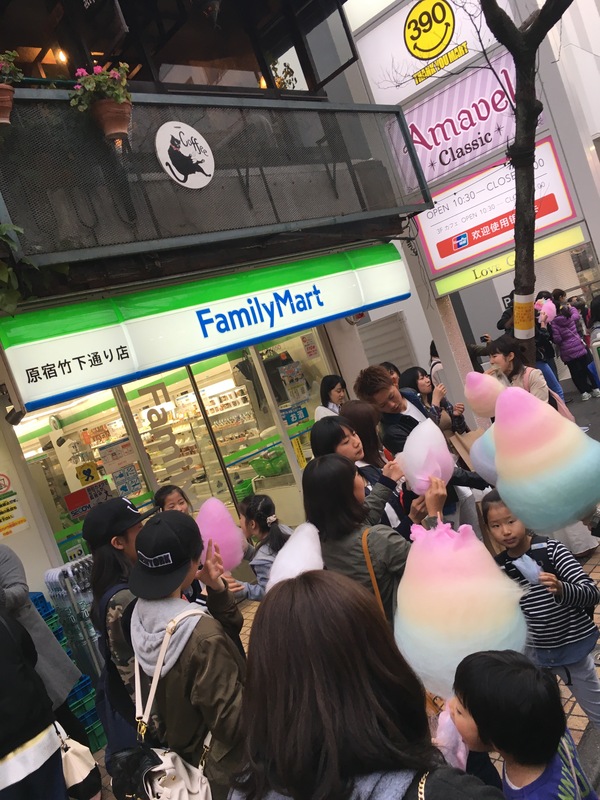 It was such a fun Japanese Street culture afternoon. 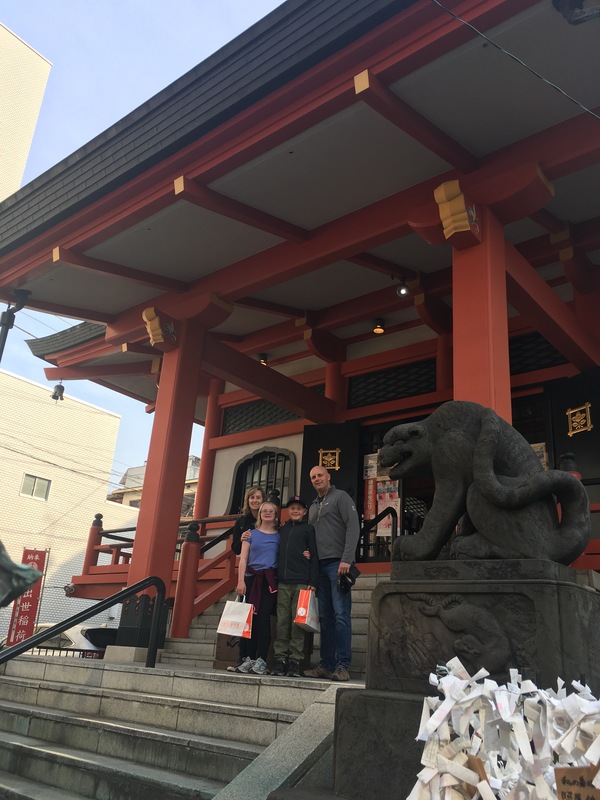 Between our museum visit in the morning and exploring in the afternoon/ evening we experienced a wide spectrum of Shinjuku culture. Believe it or not, we still didn’t get to everything on Katie Shinjuku list! I’m looking forward to our next Shinjuku adventure! 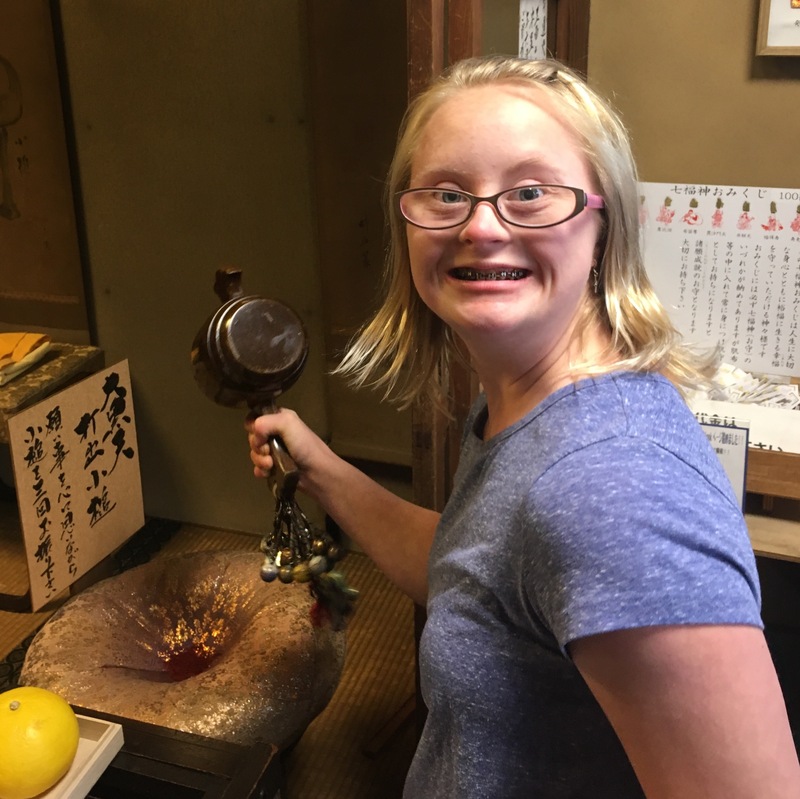 On Monday, Katie and I decided to check out a couple spots in Tokyo with beautiful Sakura. The first place we visited was the Shinjuku Gyoen National Garden. We met at the Kanazawa-Hakkei train station. It was about an hour on the train ride to the closest station and then a quick 10 minute walk to the garden. Several articles we read listed Shinjuku Gyoen National Garden as the number one spot in Tokyo for Sakura viewing. It is easy to see why. The trees were magnificent. We arrived by 10:30 and were glad we did. The garden was already becoming quite crowded. It was another beautiful day and I think many people had the same idea! The Sakura trees were everywhere throughout the garden. There were a variety of colors. From white to pale pink to the deep pink. I tried to capture all the colors in this photo. Here are a couple of my favorite photos of the Sakura trees within the park. Katie pointed out the beautiful contrast between the serene gardens and the city skyscrapers in the background. Ahhh, wabi-sabi indeed. We had fun trying to hide in the Sakura and take selfies. Shinjuku Gyoen National Garden is my favorite Sakura spot so far. It was absolutely magical. 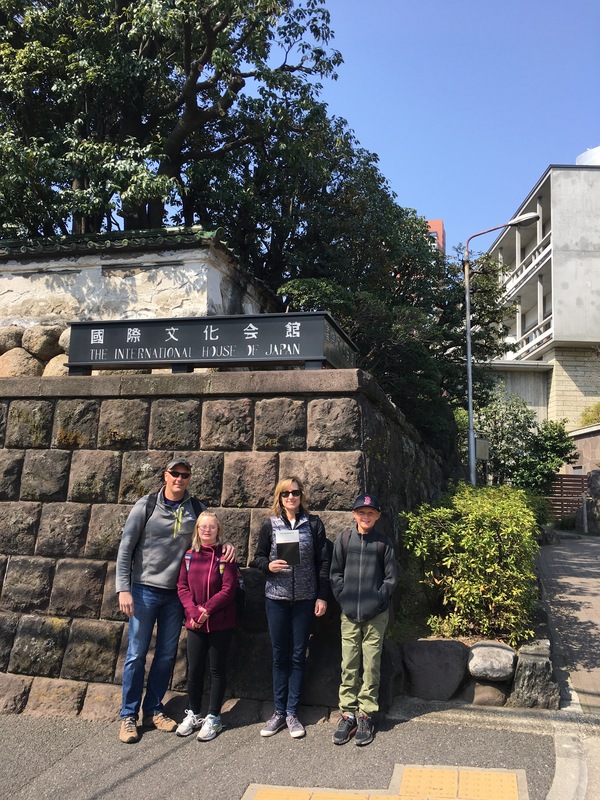 After visiting Shinjuku Gyoen National Garden, we caught the Tokyo Metro to Meguro to see the Sakura along the Meguro River. The blossoms were spectacular. The pathways along the river stretched out for such a long way. It was serene. These blossoms were more of the blush color. Team Blush had a strong presence today. The lanterns created a fun ambiance and great for snapping a few portraits. I’m so excited to have such wonderful weather this year during Sakura season. I’ve strategically planned out my week to capture different parks and gardens. I hope you enjoy seeing the pictures as much as I do chasing down the Sakura! After a much need night of sleep after making the long trip to Japan, Cindy and I were out the door early. 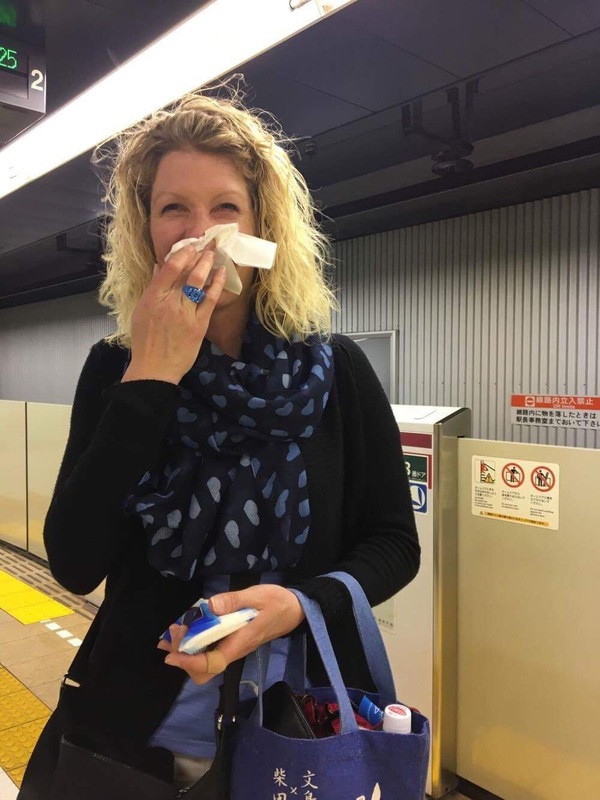 We caught the 9:03am train to Tokyo Wednesday morning. 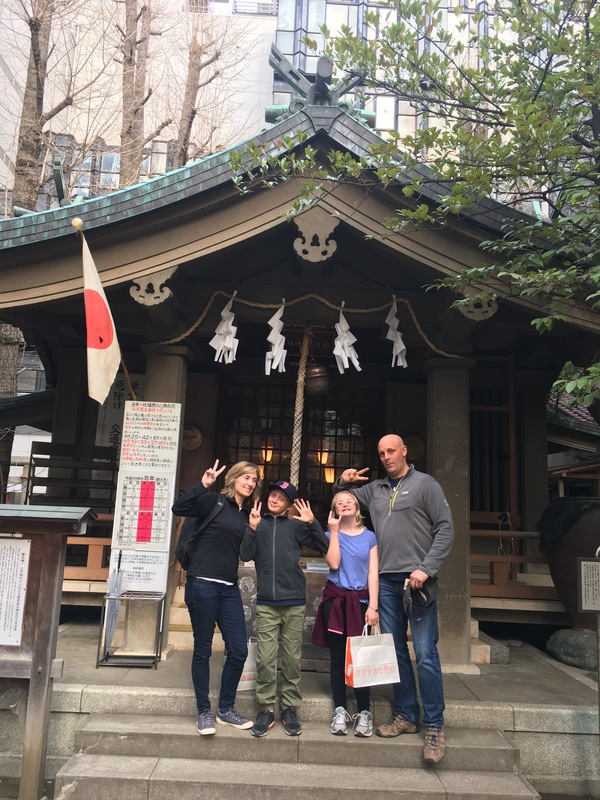 Our first mission was to walk the Meguro Seven Lucky Gods pilgrimage. Before we left, I starred the 6 temples and shrines in Google Maps. The entire walk took us about 2.5 hours. We had a couple of detours at the Daiso and Family Mart. Here are pictures of the first three temples. Cindy collected two Gods at the third temple. We also started her off with a temple book to document each temple / shrine visit. The fourth temple is one of my favorite in Tokyo. There are so many statues. Soon we were crossing the Meguro River and on our way to the last two temples. We found all seven Gods! Extra luck for us this year. 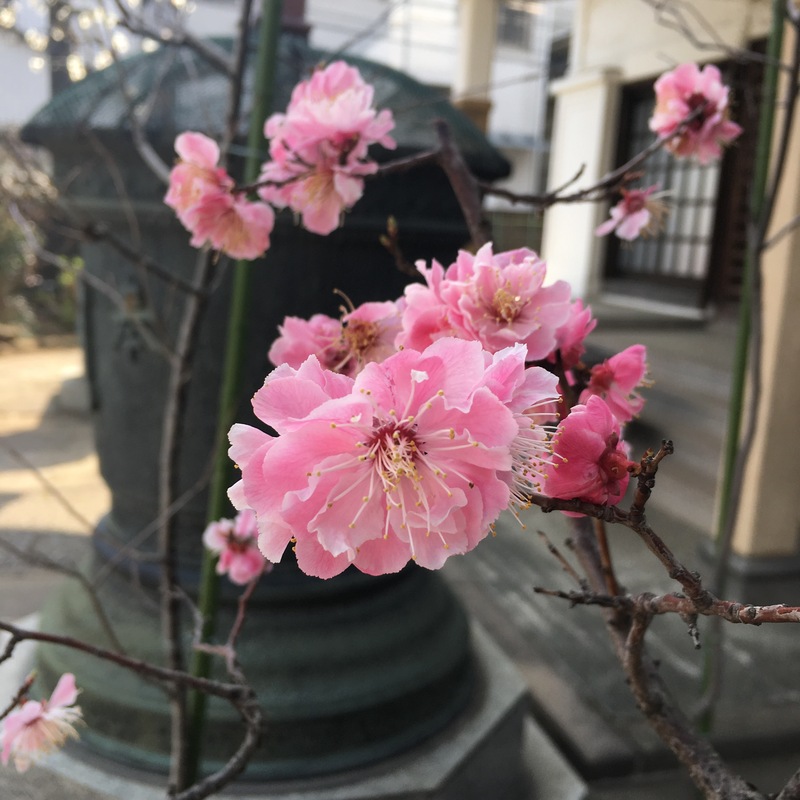 As we were walking, we had a few ume (plum) blossom sightings. 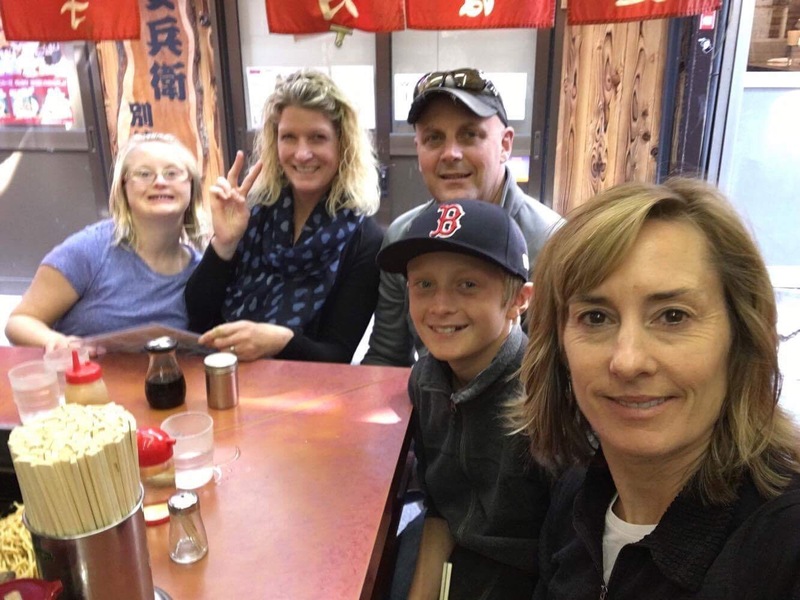 After our Lucky Gods adventure, we were ready for lunch. Nothing sounded more perfect on an overcast damp winter day than ramen. It hit the spot! After lunch we worked our way to Shibuya Crossing. 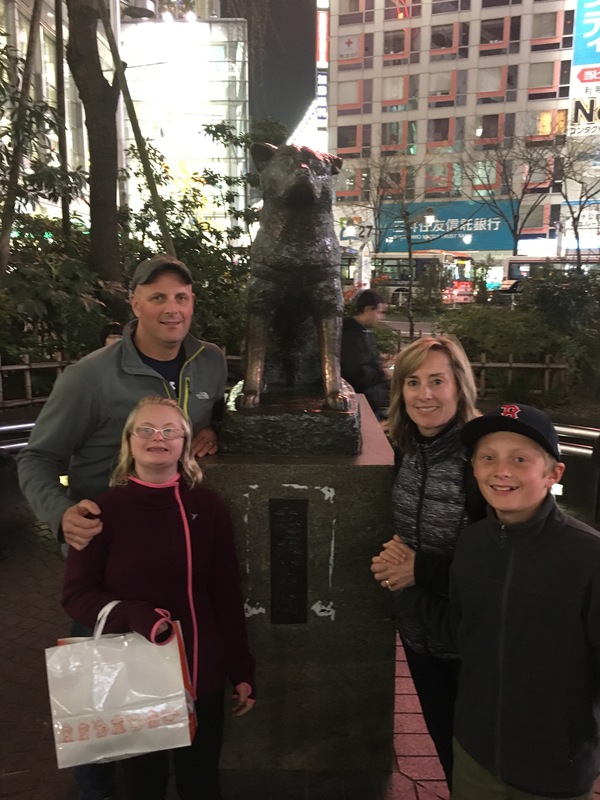 We saw the Hachiko Memorial and the Shibuya scramble. We decided to check it out from the second floor of Starbucks! Dave made us reservations at the New Sanno for the night. After exploring and shopping through Shibuya, we decided to go check into the hotel and drop our stuff. After a short reprieve, we hit the streets for more adventures! We hopped the train and headed to Harajuku. The first place I needed to take my sister in law from Chicago was Garrett’s! We picked up a few samples of yummy goodness before heading to Hedgehog Harry’s, the hedgehog cafe in Harajuku. Once I was able to get past my aversion to rodents, we enjoyed our time. We paid for 30 minutes and a snack to feed the hedgehogs. The hedgehogs were cute and sleepy. When they finished their snacks and feel soundly asleep, we decided to make our exit. It was a fun and unique experience. We can now say we have been to the first hedgehog cafe in the world. Ha! After visiting the hedgehogs, we stopped for a burger at Wolfgang Puck’s restaurant. The best part was sharing the experience of Japanese burger wrapper with Cindy! After wandering around Harajuku a little more, we decided to work our way to Roppongi for one final experience. We went to Tokyo City View. It is located in the 52nd floor of the Mori Art Museum building. The night time view of the city was spectacular. Tokyo Tower is the bright building on the right. Tokyo Skytree is the faint very tall building in the background on the left. I have never seen so many lights! This will definitely be on Julia’s nighttime Tokyo tour. We were returning back to the room after 9 pm. We had a long day packed full of fun. Tomorrow we have even more planned to see in the city! But now, I must sleep! Katie and I have been waiting for a nice day to take a trip up to Tokyo to explore the area around Shinjuku station. We considered this a reconnaissance mission of sorts. We thought maybe this area would be good to take upcoming visitors and Katie’s kids. Shinjuku is about an hour and fifteen minute train ride from where we live. I marked several spots in blue on Google Map to guide our exploring. Our first stop was to visit the lion statue near the Shinjuku East exit. The lion was built and maintained by the Tokyo Shinjuku Lions Club. The hole in his mouth is for donations. The Shinjuku lion is also a common meeting spot when meeting up with friends. After our stop at the Shinjuku lion, we walked over to see the Mode Gakuen Cocoon Tower on the west side of Shinjuku station. The building is home to a very popular and highly prestigious Fashion School in Tokyo. We worked our way back to the east side of the station and walked towards the Shinjuku TOHO building to see Godzilla. The lighting is a little strange and makes the sky look very blue. The head is next to a hotel and you could visit the terrace. So, we did! This sign made us curious. Listen as Katie touches the black hole. After visiting Godzilla, we walked around the Kabukicho district. More commonly known as the red light district. Yes, even in Tokyo. Kabukicho was pretty tame during lunchtime on a Tuesday. We were good with that. 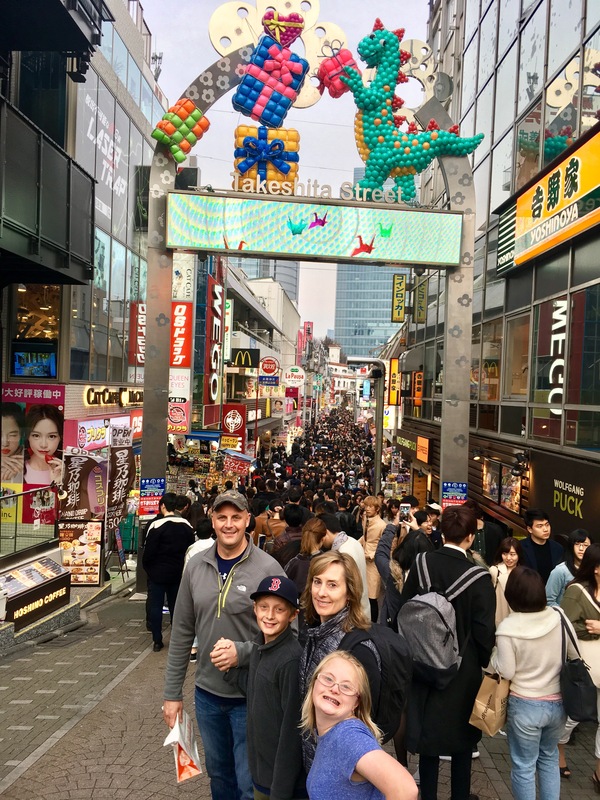 We took a few pictures outside the Robot Restaurant, Samurai Museum and of King Kong. We decided to make our way out of Kabukicho and find some lunch. Katie used her amazing Google Maps skills and located us a conveyor belt sushi restaurant while I was shopping for lotion at The Body Shop. The color of the sushi plate identified the price. I stacked our plates for a colorful effect. It was then I realized the delicious tuna I was grabbing was on silver plates! ¥520! No wonder it tasted so good! After lunch we started working our way towards Shinjuku Gyoen (garden). However, we were sidetracked quickly when we saw the Tokyu Hands store. We decided to go shopping instead and save the garden for a warmer spring day when we have a better chance to see flowers blooming. So, back to the main mission, reconnaissance. We did learn a good bit about the area. There are some good spots for tourist photos and shopping. I will definitely return this spring to visit the gardens. Or at night to see the view of the city from the Park Hyatt Tokyo (the hotel from the movie Lost in Translation). I’ll just be sure if we have kids with us to come during the day time and/or avoid Kabukicho!! I took the Cummings on a tour around the west area of Tokyo on Monday. Dave called on Sunday and was able to reserve two rooms for us at the New Sanno Hotel. This would enable us to spend the entire day exploring and not having to take the train all the way home. Here, Sara was able to deliver a book her father published of his notes and recordings from a conference he attended during the 1960s. Fortunately, one of the receptionist spoke very good English. Sara left the book with the receptionist and she in return gave Sara an email for her father to use to contact the library. Mission complete. Our next order of business was to drop off our bags at the hotel. As we walked through Roppongi, we could see Tokyo Tower. 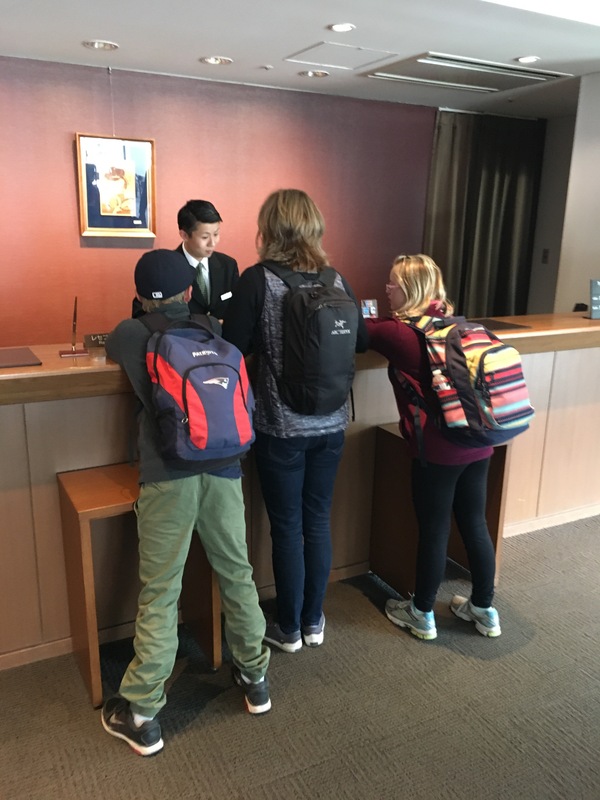 At the hotel, we registered for our rooms and left our bags with the bellhop. Back to the train station we went! This time our destination was lunch! The Vernal Equinox is a holiday in Japan making it difficult to find a place not too crowded at lunch. 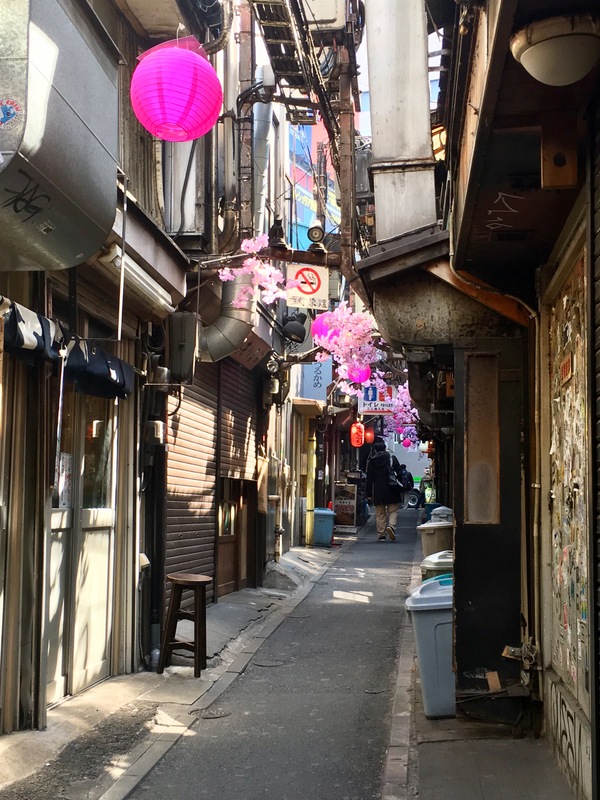 Outside of Shinjuku station, we found a cute little back alley filled with different ramen shops. It was the perfect spot to fuel our Seven Lucky Gods pilgrimage. Lucky us, there were five seats available! With our lunch mission complete, we set out on the Shinjuku Seven Lucky Gods pilgrimage. Seven temples to find! At our first temple, Taiso-ji, we collected Hotei and purchased the boat the Gods would rest upon. Hotei: God of happiness, family, peace and protection from illness and disaster. The second stop was at the Hozen-ji Temple. Here we collected Jurojin. Jurojin: God of long life and protection from illness. I knew our next stop was a tricky one to find and I took us down a couple dead end streets before finding the path to the temple. Without too much delay, we arrived at the Itsukushima Temple. Here we collected Benzai-ten. Benzai-ten: Goddess of music, arts, and speech. Our fourth stop was around the corner. We walked over to the Eifuku-ji Temple. The Eifuku-ji Temple is dedicated to Fukurokuju. Fukurokuji: God of health, happiness, and long life. The fifth temple was a bit of a walk and required a little refueling. A short stop at the Family Mart for ice cream and we were on our way! About 15 minutes later we arrived at the Kyo-o-ji Temple. Here we collected Daikoku-ten. Daikoku-ten: God of grain harvest and wealth. 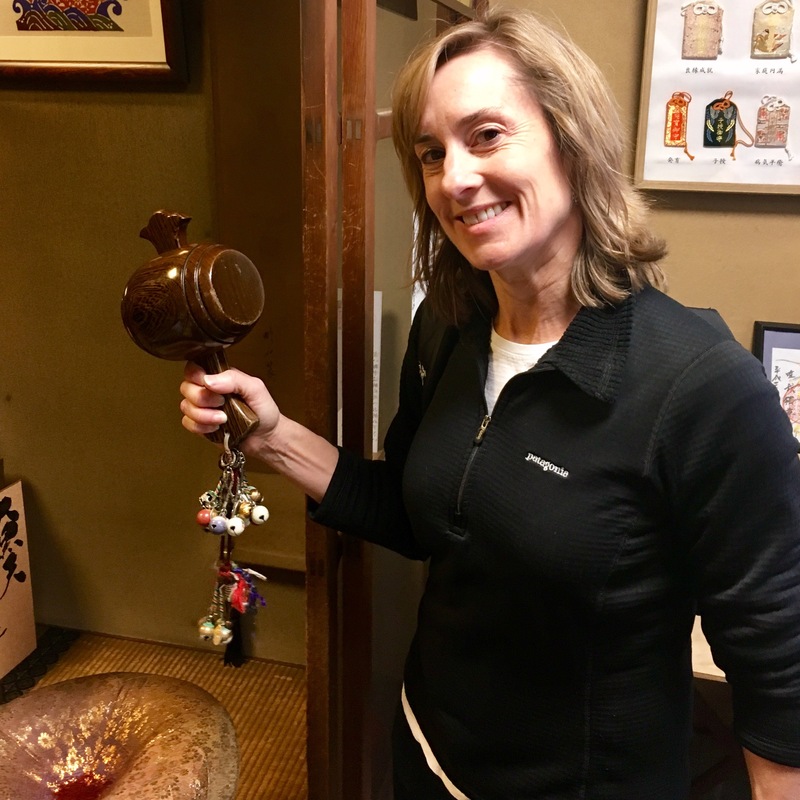 Everyone also had a chance to shake the lucky mallet for wealth! To reach the sixth temple we took a quick train ride to the Zentoku-ji Temple. This temple is dedicated to Bishamon-ten. Bisamon-ten: God of protection from disaster and evil. As we were leaving the temple, we realized we needed to pick up the pace in order to ensure we made it to the last temple on time. Everyone stepped it out! I was so proud of everyone! We made it to Ushi Kitano a Shinto Shrine. But, guess what – it was the wrong one! Yep, I messed that one up! Gah! It was 1600. Hopefully, the temple we wanted to visit stayed open until 1700. Back to the train we went!! Our final God awaited at the Inari Kio-jinja Shrine. Here we collected Ebisu-jin. Ebisu-jin: God of prosperous business. I consider us extra lucky after this pilgrimage- we found all seven plus one additional temple!! 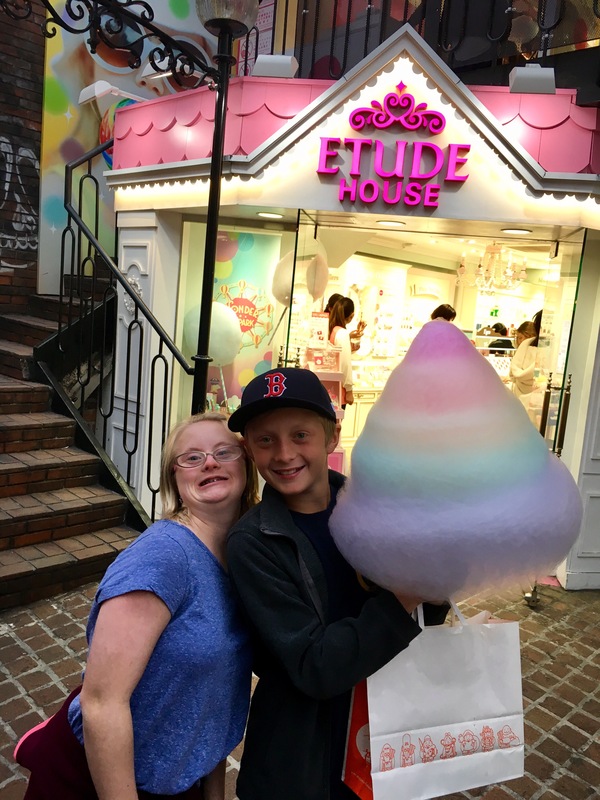 After completing our pilgrimage, we went to Harajuku for the reward I promised – cotton candy. 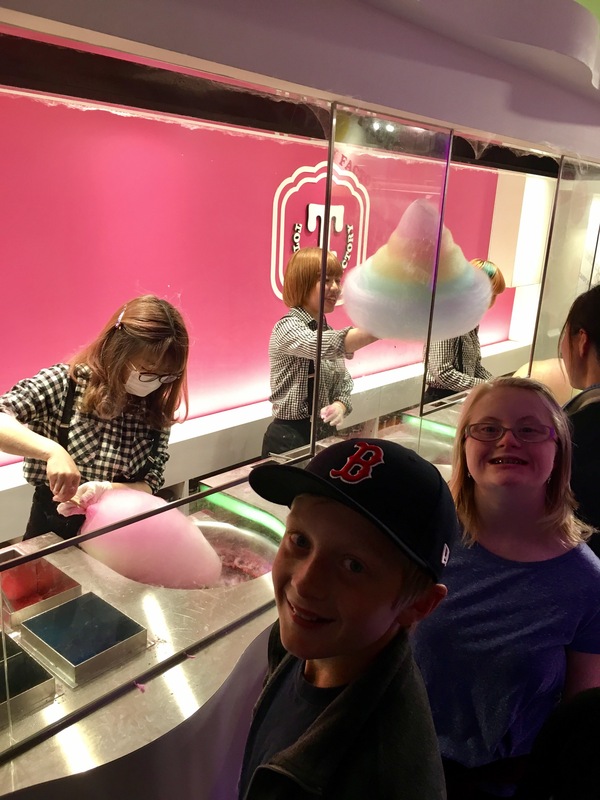 And not just any cotton candy… a mountain of cotton candy! 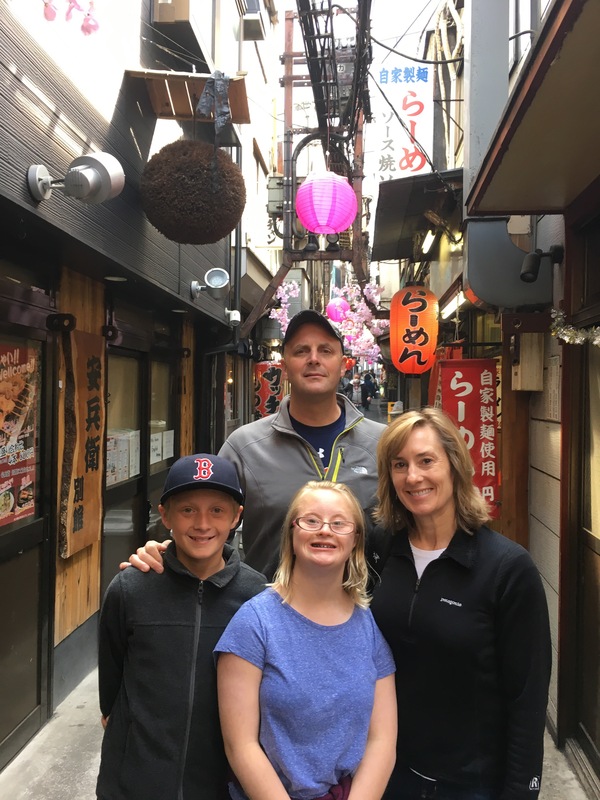 But first, we needed a family picture at Takeshita Dori! This part of the scavenger hunt was pretty easy. The cotton candy was everywhere! 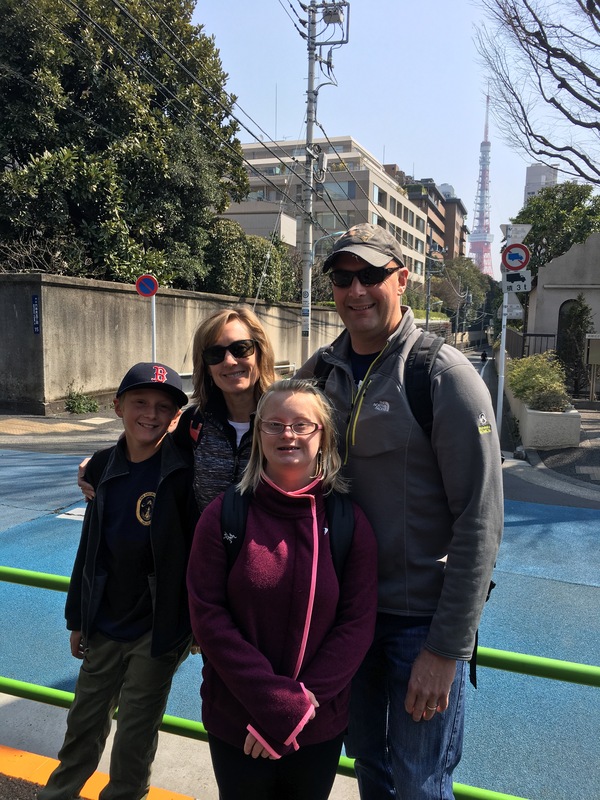 We enjoyed walking around Harajuku and seeing so much “kawaii!” Next up- finding Shibuya Crossing and a snapping a picture with Hachiko statue. Done and done! Time to eat dinner. Oh, boy… always a bit of a scavenger hunt and with two kids it can be tricky. If James had his pick, we would eat ramen again. 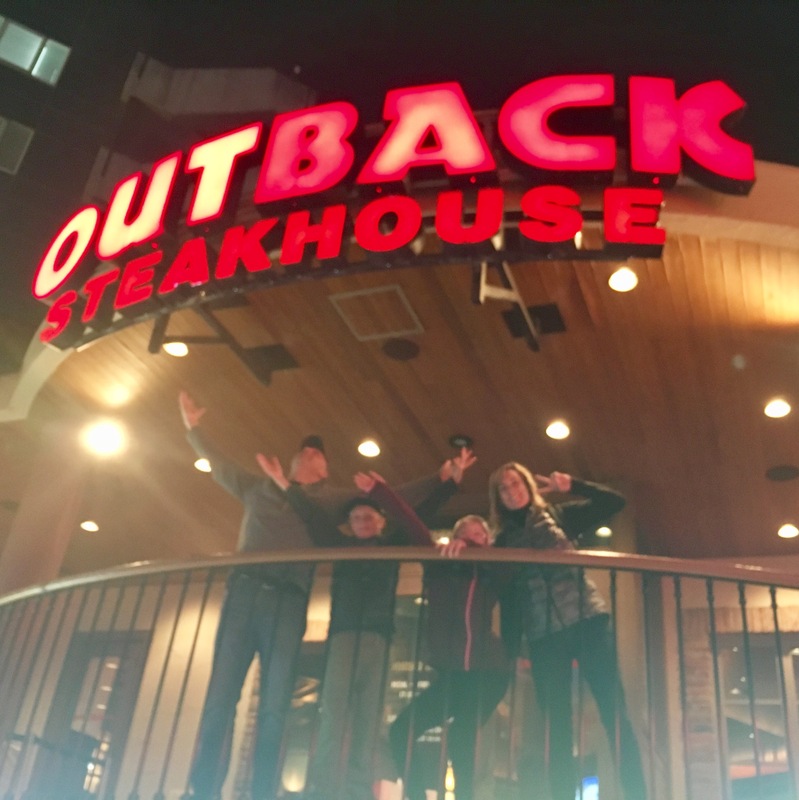 While walking around Shibuya we turned the corner and saw Outback Steakhouse. Seriously. Our search was over. The American mothership called us home. 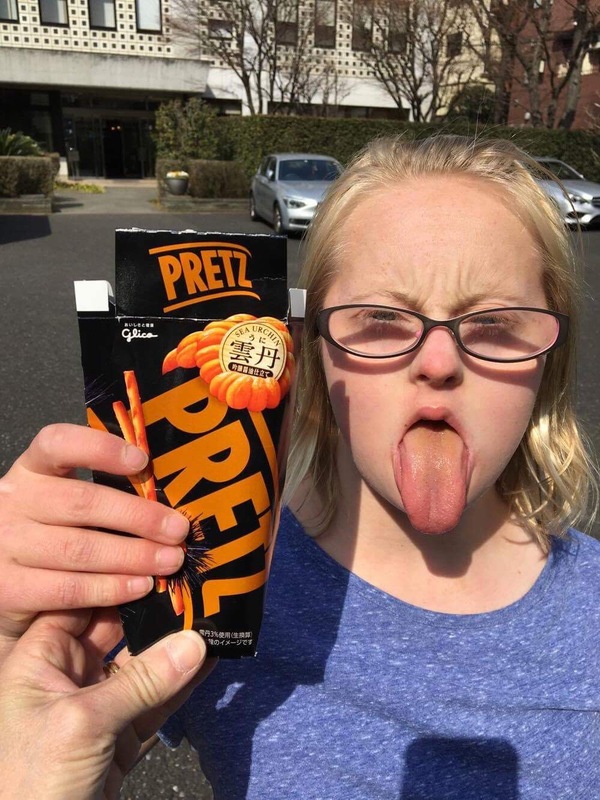 We all agreed, this was much better than the sea urchin pretzels Delaney picked up earlier in the day! 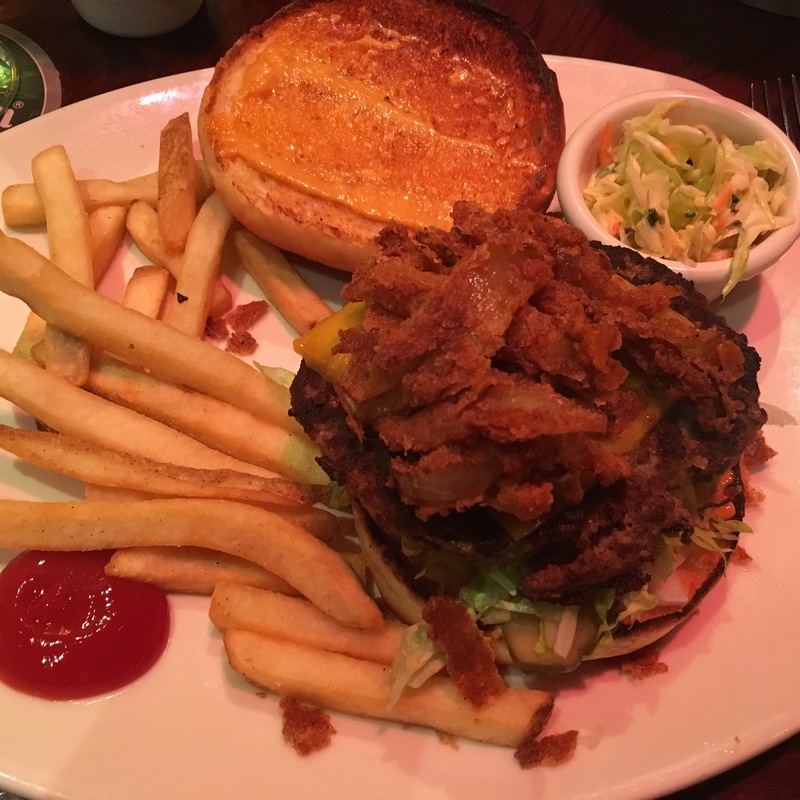 This massive burger with blooming onions on top made my scavenger hunt complete. The day was quite an adventure. I lost track of how many trains we rode. Apple steps told me we walked over 10 miles. Even after a full day of walking and occasional wrong turns, I’m the lucky one. I was able to spend the day with friends doing what I love – exploring! For marathon weekend, we are staying at a luxury hotel adjacent to the start of the marathon. The Keio Plaza Hotel. Let me start with, the hotel offers a 34th floor lounge with FREE beer, wine and snacks. The view from the 34th floor. The room is BIG compared to our “business hotel” last weekend. Simultaneously, the price tripled. “Ahhh, it’s whatever.” We are here for Tokyo Marathon weekend. Bucket list. Once in a lifetime. I want to experience everything. This luxury hotel is very spacious. A couple pictures for perspective. One more for perspective. Those long American legs. From mid calf down, my legs are not supported by the couch. Besides space, free drinks, and snacks, the luxury hotel provides a step up to with respect to toiletries. You need it – they’ve provided. PS. If the hotel goes out of business after we leave… its Dwyer’s fault. He drank too much free beer… or maybe it was my bottle of wine or three. Kanpie! 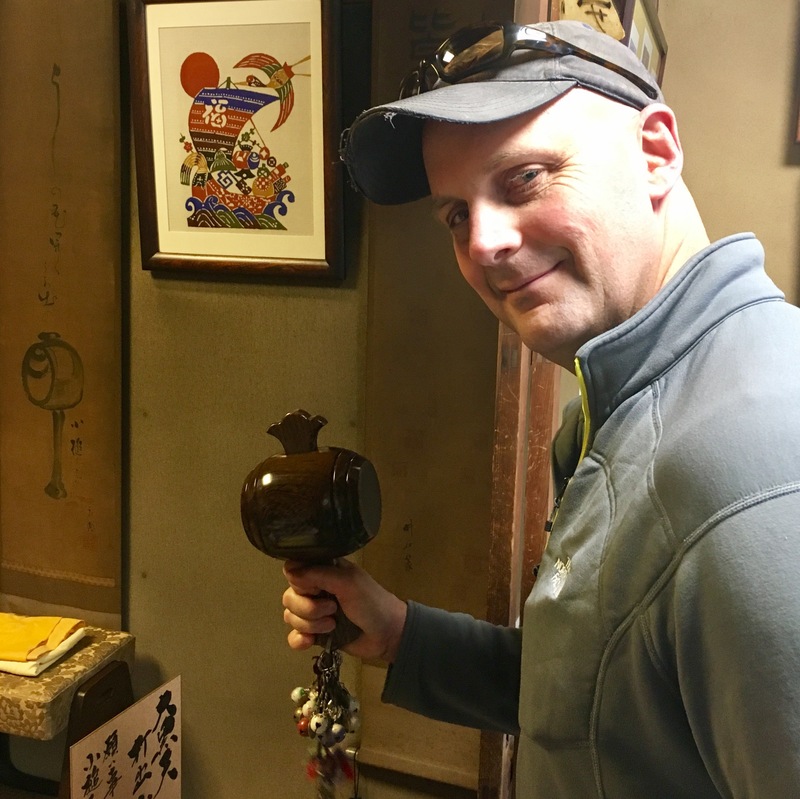 The “Shichifukujin” or Seven Lucky Gods pilgrimages are quickly becoming one of my favorite adventures. The pilgrimage reminds me of a modern day urban scavenger hunt. You must find the Seven Temples/Shrines, stamp your temple book and retrieve your cute figurine. All of this while using Google Maps, a map found on the Internet and if you’re lucky, a little bit of broken English from a monk. Or as in case today, a monk who spoke no English but was great with giving directions in Japanese while pointing at a map. I’ll come back to that story in a little bit. This is my third Seven Lucky Gods adventure. First in Meguro and then in Zushi. Each time, I receive information about the God’s meaning. I will share what information I was given today, which may vary a little bit from what I have told you previously. Dina and I set out this morning to Shinjuku. Shinjuku is located on the northwest side of Tokyo. It was a little over an hour away. Here was our route. Yesterday, I marked all of the temple/shrine locations with a star so it would be easier to navigate between them. We started at the bottom and walked toward the center cluster. Then walked to the temple on the far left. Then we took the train to the two temples on the far right. At our first temple, Taiso-ji, we collected Hotei and purchased the boat the Gods would rest upon. Hotei: God of family, peace and protection from illness and disaster. From here we walked towards the Hozen-ji Temple. However, we were sidetracked along the way by an amazing bakery. I enjoyed a delicious chocolate croissant. I felt super lucky it was chocolate and not red bean paste! Around the corner was the temple. Here we collected Jurojin. Jurojin: God of long life and protection from illness. 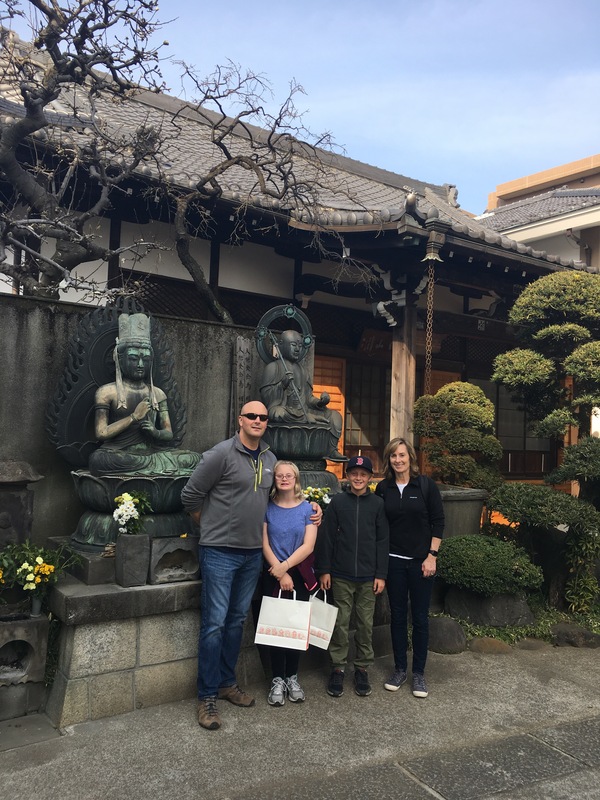 Our third stop was at the Itsukushima-Jinja Shrine. It was literally in the corner of an intersection. There was a Koi Pond, Tori Gate and Shrine. Yet, no person was present. 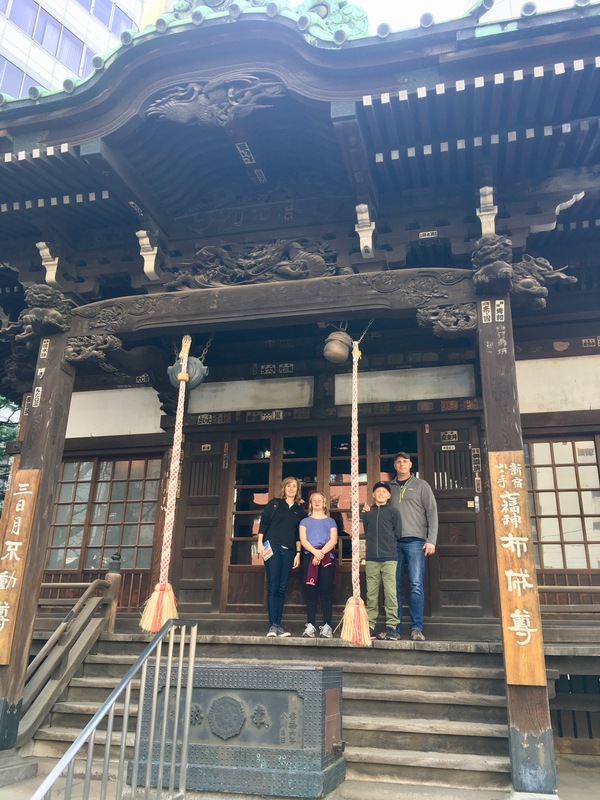 We decided to continue our journey to the fourth temple, Eifuku-ji Temple. We thought perhaps we could ask at the fourth temple where to go for the third stop. As I learned in my previous pilgrimage, one must be bold and knock on a door or ring a bell or even just walk inside the temple. Feeling brave, Dina and I went into the temple. There was a small doorbell next to a cushion. In English, it said “bell.” So, we pushed it. Simultaneously, there was a motion detector that kept going off when we moved. Behind the closed doors, we could hear someone moving around. In fact, it sounded like he was doing gymnastics. So, we waited. And rang the bell again. And waited. And rang the bell again. Finally, a monk came out not because he was responding to our ringing. He was doing his monkly business and we startled him so badly we thought we might have helped him finish his path to enlightenment. He almost fell over. We tried not to laugh. He recovered immediately and promptly came over, greeted us, set out cushions for us to sit upon and then went to stamp our books. It was incredibly hard not to giggle. 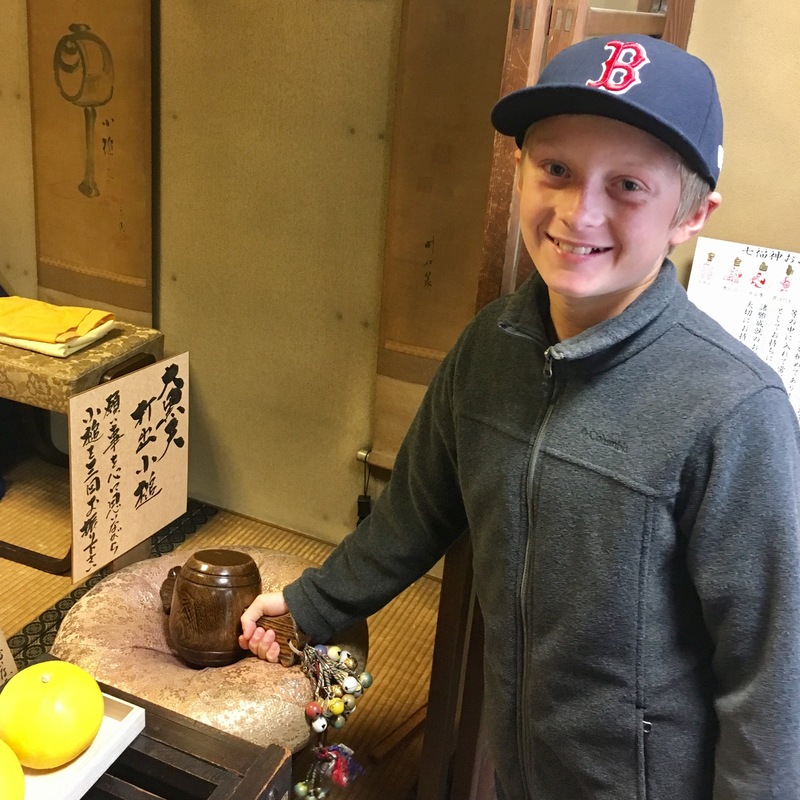 When he returned, before we could even ask how to get to temple number three, he took out a map and started explaining how to get there, in Japanese. Very fast Japanese. To summarize, we were at the purple dot and needed to got to the small blue dot. We had been at the large blue dot in the middle of the intersection. Again, all in Japanese with finger pointing and charades. Before leaving, we collected Fukurokuju. Fukurokuji: God of health, happiness, and long life. The other strange part of the conversation was that the monk was so happy to give us directions he almost forgot to give us Fukurokuji. We finally asked and held up our fingers showing little God. More charades… Ahhhh, hai! Perhaps, the funniest part, we actually made it to the Itsukushima Temple. Here we collected Benzai-ten. Banzai-ten: Goddess of music, arts, and speech. Plus, a few early cherry blossom pictures! 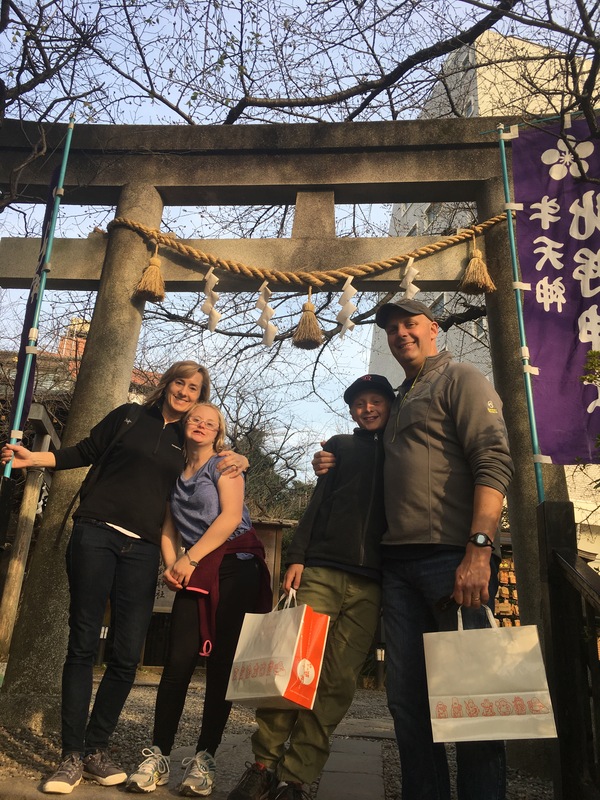 Our fifth stop was at the Inari Kio-jinja Shrine. This shrine was so tucked away!! We collected Ebisu-jin. Ebisu-jin: God of prosperous business. My favorite picture at this shrine was of the banana at the alter. It seems to be glowing! To get to the final two temples, we took the train to save a little time and warm up! 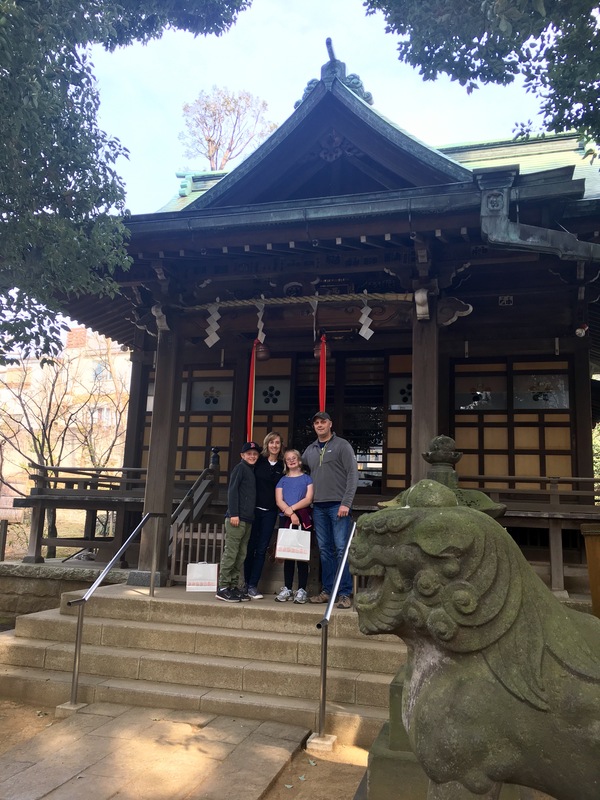 Our sixth temple was at the Kyo-o-ji Temple. Here we collected Daikoku-ten. Daikoku-ten: God of grain harvest and wealth. At this temple, there were many cute statues. Inside the shrine, we were greeted by a monk who encouraged us to open the window and shake the mallet three times for our wish to come true. So, of course, we shook and wished!! Our final temple was Zentoku-ji Temple. This temple is dedicated to Bishamon-ten. Bisamon-ten: God of protection from disaster and evil. The completed Seven Lucky Gods of Shinjuku. We never received an explanation of the boat during our adventure and so, I looked it up when we returned home. One explanation is the Seven Lucky Gods travel together on a treasure ship (Takarabune) and visit Japanese ports on New Year’s Eve to dispense happiness. Also, the symbol on the flag of the ship is the Chinese character for BAKU. BAKU is a fictional creature said to devour or prevent nightmares. Children are told to place a picture of the ship with the Gods under their pillow on the evening of January first. If the child has a good dream that night, they will be lucky all year. It was a fun and successful day exploring another part of Tokyo. Honestly, I was pretty impressed with our navigation skills and ability to find all seven Temples/Shrines.